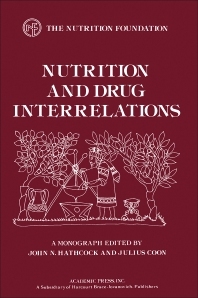 Nutrition and Drug Interrelations examines and presents the different relations of nutrition, metabolism, and effects of drugs, including drugs' positive effects in the field of animal husbandry and human and veterinary medicine. This book also highlights the importance of the interrelations between nutrition and drugs. The introductory chapter gives an overview of the variable role of food in humans on a historical and sociological context and perspective. The first section of this book deals with the impacts of drugs on the nutrition process. These impacts can either be harmless or harmful depending on the adequacy of nutrition. The second section of this book describes some of the many influences of nutritional condition on biochemical competence to cope with xenobiotics, including drugs. The third section highlights the various uses of pharmacological agents in food production. This section also discusses some concerns about the effect in the food chain of pharmacological agents. The last section in this book demonstrates the overlap in boundary between dietetic and pharmacological treatments. Given focus is the use of vitamin D derivatives and megavitamin treatments with doubtful benefits. This book will benefit most students and professionals in the field of food and nutrition, human and veterinary medicine, and animal husbandry. The subject area in this book will also yield interest from people involved in metabolism, nutrition, and pharmacology.